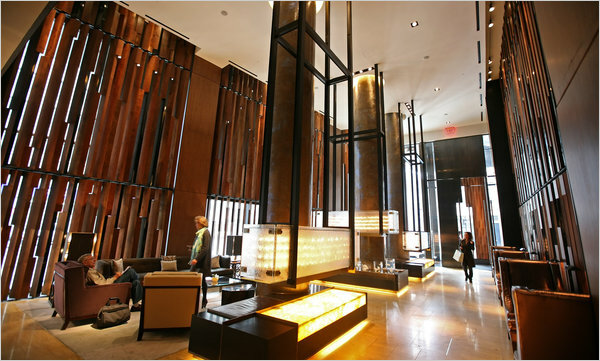 The lobby of the Trump SoHo hotel, which opened in April on Spring Street. Donald Trump’s first hotel in lower Manhattan has been nothing if not controversial. Community residents tried to block construction of the 46-story Trump SoHo, claiming it would tower over everything around it. It does, which is why the views from the upper floors — west to the Hudson River or east across Lower Manhattan — are exceptional. The lobby and bar, designed by the Rockwell Group, with dark wood and dark leather, are not as gaudy as one might expect from a Trump property. The rooms, however, feel less adventurous than the ones Rockwell designed for the Andaz Wall Street, a new hotel farther downtown. Perhaps that’s because all 391 rooms are also condominiums, which means they need to appeal to the kind of buyer willing to pay more than $1.2 million per unit. Despite the name, this isn’t really SoHo. More like NoHoTu — North of the Holland Tunnel — and there’s a constant parade of tunnel traffic along Varick Street. The front door itself is on an unlovely section of Spring Street. Still, the nice parts of SoHo, and much of TriBeCa and Greenwich Village, are in easy walking distance. My room had lots of handsome Art Deco-derived furniture. The bed, beneath a huge dark leather headboard, was supercomfortable and offered views of the Hudson River through the floor-to-ceiling windows. One nice touch: You can control the lights, the drapes, the heating and the air-conditioning using the TV’s remote control. The hotel is nonsmoking, but, oddly, as our noses repeatedly informed us, someone was smoking cigarettes in a neighboring room. On a windy night in May, the building creaked like the floorboards of a haunted house. Very large, almost a bathroom suite, done up in highly veined gray marble. The toilet is in its own room, the shower is a large glass booth and the tub a luxurious soaker against the floor-to-ceiling windows. The spare, copper-colored shower and sink hardware, designed by Rockwell Group, was gorgeous. Quattro Gastronomia Italiana, the ground-floor Northern Italian restaurant, is handsome and popular. And Kastel, the cavernous bar (with its own street entrance), offers bottle service and D.J.’s until the wee hours. Much quieter is the second-floor library, a stylish room overlooking the lobby, amply supplied with art and architecture books from Taschen. Right now, there’s a very small fitness center; guests are offered passes to a New York Sports Club a couple of blocks away. A rooftop pool and bar, and a spa with a larger health club, are expected to open this summer. We ordered breakfast at 6 a.m.; it arrived at 6:30. Both dishes — a “Quattro omelet” with tomatoes, zucchini, basil and mozzarella, and “Italian toast” (a version of French toast made with pandoro) — were excellent but pricey ($55 for the two). The wonderful Nespresso Cube single-cup coffee maker in the room meant we didn’t have to pay for coffee. We were lucky to snag a room at $299 in early May; the hotel commands as much as $599 some nights. At that price, ask for a room with a great view, and hope it isn’t windy. Trump SoHo, 246 Spring Street (Varick Street); (212) 842-5500; trumpsohohotel.com. of the table on a sunny afternoon or balmy evening. If you make the CIA your dining destination in the month of June, you're in for a real treat. We are capitalizing on the bounty of the strawberry harvest to create one-of-a-kind dishes in each of our restaurants. And in American Bounty, Escoffier, and Ristorante Caterina de' Medici we've also created special cocktails with names like Chocolate Strawberry Martini, Strawberry Mojito, and Strawberry Lemonade. You won't want to miss experiencing the creativity and exquisite execution of our strawberry-inspired dishes and drinks.Make your reservations today! Take a culinary journey to Sardinia, Italy on June 4 with your expert guides Chef Gianni Scappin and Maître d' Vincenzo Lauria. Join them at Ristorante Caterina de' Medici for a four-course luncheon featuring truly authentic Sardinian cuisine. The menu includes "paper" bread with tomato salad and Sardinian pecorino, fregola pasta with clams and shrimp, lamb stew with potatoes and bay leaves, and sweet sebadas made of premium Sardinian pecorino and honey! Only $35 plus service and tax. Reserve your place at the table! A gift certificate valid at any of the college's student-staffed, award-winning restaurants is the perfect present for Dad or a recent high school graduate. With luck, they'll take the whole family out to celebrate with them. Strawberries and Rhubarb, Oh My! Want to try your hand at creating strawberry delights at home? Watch CIA Pastry Instructor Stephen Durfee expertly demonstrate how easy it is to make a rhubarb and strawberry shortcake that will delight family and friends. And now, you can download the recipe! Make your reservation today for one of these student-run themed events. Designed to take the diner on a food journey from Asia to New England, Mexico, Italy, and France. The meal is a reflection of the diversity of cultures and cuisines in America and among the CIA community. Proceeds to benefitThe Brian Smith Memorial Scholarship Fund. Learn more or make your reservation now. Cocktail hour and silent auction on the Ristorante Caterina de' Medici Plaza, followed by dinner. Proceeds to benefit The Waner Children's Vascular Anomaly Foundation and The Brian Smith Memorial Scholarship Fund.Learn more or make your reservation now. Cocktail hour with silent auction followed by dinner. Proceeds to benefit theBrian Smith Memorial Scholarship Fund and the National Military Family Association. Learn more or make your reservation now. Please Note: Online registration closes at midnight on 6/11/2010. (2 weeks prior to the event). • Over 1,500 Rods, Customs, Classics & Muscle Cars thru ’72. Kickstands go up at 8am, Saturday, June 19th,for theInaugural Mt. Beacon Biathlon, with two 10-mile bike races on Main St. sandwiching a run up and down historic Mt. Beacon, rising 1,531 feet above sea level. The bike/run offers $1000 to the winner! It's sponsored by Healey Brothers Jeep and Beacon Chamber of Commerce. BELLEVUE SOUTH COMMUNITY ASSOCIATION STREET FAIR, Lexington Avenue, between 23rd and 34th Streets. Sunday, 10 a.m. to 6 p.m.
CARING COMMUNITY FESTIVAL, Washington Square North and Waverly Place, between University Place and Avenue of the Americas, Greenwich Village. Saturday, 11 a.m. to 6 p.m. COALITION FOR A LIVABLE WEST SIDE FESTIVAL, Broadway, between 72nd and 86th Streets, Manhattan. Sunday, 11 a.m. to 6 p.m.
CONEY ISLAND Rides open for the season in Luna Park, West 10th Street and Surf Avenue, Brooklyn. Saturday and Sunday, 11 a.m. to midnight; Monday, noon to midnight; each ride, $3 to $5; unlimited, four-hour wristband, $26 on weekdays, $30 on weekends ($30 and $34 for six-hour bands); (718) 373-5862; coneyisland.com. The exhibition “Luna Park Revisited,” with photographs and other items will be on view at the Coney Island History Project, under the Cyclone Roller Coaster, Saturday through Monday, 1 to 6 p.m. and weekends through Labor Day; free; www.coneyislandhistory.org. 15TH LOWER EAST SIDE FESTIVAL OF THE ARTS Theater for the New City, 155 First Avenue, at Ninth Street, East Village. A free indoor and outdoor festival with music, dance, art, drama and performance art. Friday, 6 p.m. to midnight; Saturday, 11 a.m. to midnight; and Sunday, 4 p.m. to midnight. (212) 254-1109;theaterforthenewcity.net. FIRST ANNUAL DREAMLAND BEACH PARTY Water Taxi Beach, 2 Borden Avenue, Long Island City, Queens. With music, dancing, a fashion show, contests and a raffle. Sunday, noon to 5 p.m.; dreamlandorchestra.com. $18 in advance, $25 at the door. GRAND CENTRAL SPRING FESTIVAL, 43rd Street, between Lexington and Third Avenues. Friday, 11 a.m. to 6 p.m. HISTORIC WALKING TOURS Saturday at 11 a.m., “Civil War New York,” led by Maria Dering and meeting outside the Church of the Transfiguration (Little Church Around the Corner), One East 29th Street, Manhattan; $20, $15 for students and 65+; (646) 573-9509. Saturday and Sunday at 11 a.m., “Revolutionary Manhattan: The Battles in Washington Heights,” sponsored by In Depth Walking Tours and meeting on the southeast corner of Fort Washington Avenue and West 181st Street; $20; (917) 607-9019;indepthwalkingtours.com. Saturday and Sunday at 2 p.m., “The American Revolution, Civil War New York and Sept. 11 Remembrance,” in Lower Manhattan, sponsored by NYC Discovery Tours; $18; reservations and meeting place: (212) 465-3331. Monday at 1 p.m., “Revolutionary New York,” in Lower Manhattan, led by Big Onion Walking Tours and meeting at the intersection of Broadway and Murray Street; $15, $12 for students and 63+; (212) 439-1090;bigonion.com. INNOVATIVE COMMUNITY EXPO, Madison Avenue, between 42nd and 57th Streets. Monday, 11 a.m. to 6 p.m.
LOISAIDA STREET FAIR, Avenue C, between 6th and 13th Streets, East Village. Sunday, 11:30 a.m. to 6:30 p.m.
MEMORIAL DAY OBSERVANCE, Soldiers’ and Sailors’ Monument, Riverside Drive and 89th Street. Monday, 10 to 11:30 a.m., with an honor guard, wreath placement and procession up Riverside Drive to Grant’s Tomb; with Mayor Michael R. Bloomberg. 19TH ANNUAL FREE CONCERT BY THE NEW YORK PHILHARMONIC, Cathedral Church of St. John the Divine, 1047 Amsterdam Avenue, at 112th Street, Morningside Heights. Monday at 8 p.m., featuring Copland’s Fanfare for the Common Man; Haydn’s Symphony No. 49; Schubert’s Symphony in B minor; and Beethoven’s Egmont Overture, all with Alan Gilbert, conductor. First come first served; the concert may also be piped outdoors, weather permitting. (212) 875-5656; nyphil.org. 17TH PRECINCT COMMUNITY COUNCIL STREET FAIR, Lexington Avenue, between 42nd and 57th Streets. Saturday, 10 a.m. to 6 p.m.
SOCIETY OF ST. ANTHONY GIOVINAZZO STREET FAIR, Mulberry Street, between Broome and Spring Streets. Friday through June 6, 11 a.m. to 11:30 p.m.
23RD ANNUAL FLEET WEEK A tribute to the armed forces at theIntrepid Sea, Air & Space Museum, Pier 86, 12th Avenue and 46th Street, Manhattan. Friday through Monday, with pier displays, performances by members of Broadway shows Friday and Saturday at noon; a performance by the West Point Band on Saturday at 2:30 p.m. and a Memorial Day ceremony on Monday at 11 a.m.; some events are free, and others require museum admission: $22; $18 for 62+ and college students; $17 for ages 3 through 17 and veterans; free for active military, retired military personnel and children under 3. (212) 245-0072. Schedule: intrepidmuseum.org. WASHINGTON SQUARE OUTDOOR ART EXHIBITION, University Place, from East 12th Street to West Third Street, Greenwich Village. Saturday through Monday, noon to 6 p.m. Also June 5 and 6. (212) 982-6255; wsoae.org. BETHPAGE FEDERAL CREDIT UNION NEW YORK AIR SHOW Jones Beach State Park, Wantagh. With the United States Navy Blue Angels, the United States Army Golden Knights skydiving team and others. Saturday and Sunday, 10 a.m. to 3 p.m. (516) 679-7222; jonesbeachairshow.com. $10 per car. BROOKHAVEN FAIR Brookhaven Amphitheater Arts & Cultural Center at Bald Hill, 1 Bicycle Path, Farmingville. With rides, games, food and entertainment. Friday, 5 p.m. to midnight; and Saturday through Monday, noon to midnight (also June 4-6 and June 11-13); (631) 920-0910; brookhavenfair.com; $8, free for children under 3. CORPORAL CHRISTOPHER G. SCHERER MEMORIAL RUNS/WALKS At the Pulaski Road School, 623 Ninth Avenue, East Northport. Saturday, a four-mile competitive run beginning at 8 a.m., followed by a one-mile fun run at 9 a.m. and a four-mile recreational run-walk at 9:30. (631) 754-9359; cplchris.com. Fees, $30; $10 for those 12 and older ($5 for children under 12). Proceeds benefit a scholarship fund and equipment for Marines serving abroad. ETHNIC FESTIVALS with food and entertainment. Our Lady of the Rosary Knights of Columbus Italian Feast, at 759 Long Island Avenue, Deer Park; $25 for unlimited rides (adults free with paying child). A Greek Island Festival at St. Markella Greek Orthodox Church, 1960 Jones Avenue North, Wantagh; free admission. Each open Friday, 6 to 11 p.m.; Saturday and Sunday, 2 to 11 p.m.; Monday, 2 to 9 p.m. (till 11 p.m. at the Greek Island Festival); information for both:exploreli.com. LONG BEACH CITY MANAGER 10-MILE TROPHY RUNSunday at 8 a.m., beginning at Riverside Boulevard and the Boardwalk; early registration until Friday at 5 p.m. at the Long Beach Recreation Center, Magnolia Boulevard at West Bay Drive; Sunday registration begins at 6:30 a.m. at the Long Beach Community Center, 650 Magnolia Boulevard, next to the Recreation Center. (516) 431-3890; longbeachny.org; $25, $20 in advance. MEMORIAL DAY PARADES, Monday. At 9 a.m., in Hicksville, beginning at the Sears South parking lot on Broadway. At 10 a.m. in Bay Shore, beginning at Lanier Lane and Main Street. At 10:30 a.m. in East Hampton, beginning at St. Rosalie’s Church on Montauk Highway. Information for each: lifeonlongisland.com. MONTAUK EVENTS Saturday and Sunday, 10 a.m. to 6 p.m., a fine arts festival on the Village Green, sponsored by the Chamber of Commerce; (631) 668-2428. Monday at 10 a.m., a parade beginning on Main Street; (631) 324-0362; discoverlongisland.com. NORTHEAST EQUINE EXPO Belmont Park Racetrack, Belmont Park, Elmont, Long Island. With demonstrations, workshops and children’s activities. Saturday, 10:30 a.m. to 7 p.m.; and Sunday, 10:30 a.m. to 6 p.m. (877)778-3976; neequineexpo.com; $18 each day, free for children under 10. OLD BETHPAGE VILLAGE RESTORATION Round Swamp Road, Old Bethpage. Saturday through Monday, 10 a.m. to 4 p.m., “Sheep to Shawl and Music Too,” a festival with demonstrations, entertainment and games. Monday at 2 p.m., an 1880 Decoration Day Parade and Ceremony. (516) 572-8400; nassaucounty.ny.gov. $10; $7 for 60+ and for children 5 to 12; free for children under 5. SOUTHAMPTON ANTIQUES FAIR The White House, 159 Main Street. Presented by the Southampton Historical Society. Sunday, 9 a.m. to 3 p.m. (631) 283-2494; southamptonhistoricalmuseum.org. ANIMALS & ACROBATS Van Cortlandt Manor, 525 South Riverside Avenue, off Route 9, Croton-on-Hudson. An early American circus. Saturday through Monday, 10 a.m. to 6 p.m. (914)631-8200;hudsonvalley.org. $12; $10 for 62+, $6 for children 5 to 17; free for children under 5 and members. ASIAN HERITAGE CELEBRATION Kensico Dam Plaza, Bronx River Parkway, Valhalla. With food, music and crafts. Saturday, noon to 6 p.m. (914) 864-7275; westchestergov.com. MEMORIAL DAY PARADES, Monday. At 10:30 a.m. in Chappaqua, beginning at King Street and Route 117. At 10 a.m. in White Plains, beginning at Library Plaza, on Martine Avenue. At 10:45 a.m. in New Rochelle, beginning at Memorial Plaza, at Memorial Highway and Main Street (ends in Hudson Park, off Shore Road, with a barbecue and entertainment). LASDON MEMORIAL DAY ANTIQUES FAIR AND PLANT SALE Lasdon Park and Arboretum, Route 35, Katonah. With entertainment and food. Monday, 10 a.m. to 5 p.m.; (914) 273-4667;cordshows.com. $7; free for those under 13. PEEKSKILL CELEBRATION, MEMORIAL DAY CARNIVAL, Riverfront Green. With rides and entertainment. Friday, 5 to 11 p.m.; Saturday and Sunday, noon to 11 p.m.; Monday, noon to 6 p.m. (914) 736-2000; peekskillcelebration.com. All-inclusive ride ticket, $25. PLAYLAND PARK, Exit 19 off Interstate 95, Rye. The park will be open for rides and entertainment on Friday, 10 a.m. to 10 p.m.; Saturday and Sunday, 1 p.m. to midnight; and Monday, 1 p.m. to 10:30 p.m. All-inclusive daily ride admission: $30 ($25 for Westchester residents). Admission only, $5 ($3 for residents); parking, $5 ($7 Saturday and Sunday, $10 on Monday). On Sunday, from 1 to 7 p.m., a special Memorial Day tribute to the armed forces is planned, with activities including a helicopter search and rescue demonstration and a ceremony at 2:30 p.m.; discounted or free admission on Sunday for veterans with appropriate identification; preregistration: (914) 995-2146. General Playland information: (914) 813-7010;ryeplayland.org. SOLDIER’S STORIES & SONGS St. Paul’s Church National Historic Site, 897 South Columbus Avenue, Mount Vernon. Monday, 9 a.m. to 5 p.m., tours of the historic 18th-century site, with music and talks about the lives of American soldiers throughout history. (914) 667-4116; nps.gov/sapa; free. SUNSET JAZZ SOIREE Boscobel House and Gardens, 1601 Route 9D, Garrison. Friday at 11 a.m. and 3 p.m., tours of the historic house by costumed guides; free with house admission. Also Friday at 6 p.m., “Sunset Jazz Soiree,” with a performance by the Art Labriola Trio; $35, $30 for members. (845) 265-3638; boscobel.org. House admission: $16, $13 for 62+, $8 for children 6 to 14; free for children under 6 and members. WOODSTOCK-NEW PALTZ ART & CRAFTS FAIR Ulster County Fairgrounds, off Libertyville Road, Exit 18 of the Gov. Thomas E. Dewey Thruway, New Paltz. Saturday and Sunday, 10 a.m. to 6 p.m.; Monday, 10 a.m. to 4 p.m. (845) 679-8087 or (845) 246-3414;quailhollow.com. $8; $7 for 62+; free for children 12 and under. BLUES AND WINE FESTIVAL Natirar Park, Peapack Road, Peapack-Gladstone. Saturday and Sunday, noon to 5 p.m.; rain date, Monday; (609) 588-0085; newjerseywines.com. $20; under 21, free. CAPE MAY Saturday, 10 a.m. to 4 p.m., a Crafts and Antiques Fair at the Emlen Physick Estate, 1048 Washington Street; $1 admission. Sunday at 8 p.m., a free performance by the Atlantic Brass Band at the Rotary Bandstand, Lafayette Street and East Lyle Lane; (609) 884-5404; capemaymac.org. CONAN O’BRIEN Borgata Hotel Casino & Spa, Atlantic City. Sunday at 8 and 11:35 p.m. (609) 317-1000; theborgata.com. $95, $125 and $155. THE FRED D’ELIA RIDGEWOOD RUN Memorial Drive, Ridgewood. Monday, beginning 8:40 a.m., with races of one mile, and five and ten kilometers, as well as a fun walk/run. Registration fees and information: (973) 333-4837; njmasters.com/RidgewoodRun. HISTORIC COLD SPRING VILLAGE Route 9 South, north of Cape May. Saturday and Sunday, 11 a.m. to 3 p.m., a free open house with guided tours and demonstrations of life from the late 18th century to the mid-19th century. (609) 898-2300; hcsv.org. LANTUS TOUR OF SOMERVILLE BICYCLE RACE Monday at 10:45 a.m., ranging from 15 to 50 miles. Also on Monday in Somerville, from 11 a.m. to 4 p.m., a family festival with sports demonstrations, entertainment and children’s activities, on Bridge Street, between Main and High Street and at Main and Grove Streets;tourofsomerville.org; (908) 725-7223. Registration: (801) 699-5126. MEMORIAL DAY PARADES, Monday. At 9 a.m. in Clifton, beginning at Allwood and Hepburn Roads. At 9 a.m. in Maplewood, beginning at the Columbia High School student parking lot at West Parker Avenue. At 11:30 a.m. in Wyckoff, beginning at the Cornerstone Christian Church, Wyckoff Avenue. WILDWOODS Friday through Monday, the International Kite Festival with competitions and an auction. Schedule of events and other information: skyfestivals.com. Friday, 6 to 9 p.m.; and Saturday and Sunday, 8:30 a.m. to 8 p.m., the State Gymnastics Championship at the Wildwoods Convention Center; $12, $6 for children;usaigc.com. Saturday and Sunday, 9 a.m. to 5 p.m., a Boardwalk Craft Show; wildwoodsnj.com. ‘ANNIE GET YOUR GUN’ Goodspeed Opera House, Route 82, East Haddam. The Irving Berlin musical. Friday at 8 p.m.; Saturday at 3 and 8 p.m.; Sunday at 2 p.m. Through July 3. (860) 873-8668;goodspeed.org. $31 to $74.50. CHESTER TOWN-WIDE TAG SALE Saturday, 8 a.m. to 3 p.m. Maps to more than 60 locations will be available for $1 at the Town Center; proceeds benefit the Chester Historical Society;chesterhistoricalsociety.org. FAIRFIELD COUNTY MEMORIAL DAY COMMUNITY PICNIC Fairfield Museum and History Center, 370 Beach Road, Fairfield. Monday at noon. Sponsored by the Fairfield Historical Society. (203) 259-1598; fairfieldhs.org. MYSTIC SEAPORT, 75 Greenmanville Avenue, Exit 90 off Interstate 95. “Lobster Days,” Saturday through Monday, 11 a.m. to 3 p.m., with discussions about the lobster industry, storytelling, cooking demonstrations and lobster meals. Food only: $21 (one lobster) and $37 (two lobsters). Sponsored by the Rotary Club of Mystic; proceeds benefit local charities. Museum admission also required: $24; $22 for 65+ and students; $15 for ages 6 to 17; free for 5 and under and members. Combination tickets are also available. On Monday at noon, “Decoration Day 1876,” a tribute to Civil War soldiers, with a memorial service and a procession. (888) 973-2767; mysticseaport.org. NEW BRITAIN MEMORIAL DAY PARADE Monday at 6 p.m., beginning at Burritt and Broad Streets. NORTH STONINGTON EDUCATION FOUNDATION RACE AND FITNESS WALK Saturday at 9:45 a.m., a two-mile walk, followed by a five-kilometer run at 10 a.m. and children’s races for those 3 to 12 at 10:45 a.m. All start and finish at the North Stonington Grange Fairgrounds, Wyassup Road; fees, $20 and $7 (for children 6 to 13; under 6, free); proceeds benefit school programs;nsedfoundation.org. QUASSY AMUSEMENT PARK, Route 64, Middlebury. Opening of Quassy Beach and “Saturation Station.” Friday, 10 a.m. to 10 p.m.; Saturday, 11 a.m. to 10 p.m.; Sunday and Monday, 11 a.m. to 8 p.m. (203) 367-7275; quassy.com. Ride tickets, $3 each; 12 tickets, $27; also special discounts and rates. Parking, $5. 23RD CONNECTICUT GAY & LESBIAN FILM FESTIVALCinestudio at Trinity College, 300 Summit Street, Hartford. Screening programs of short and feature films. Friday and Monday at 7:30 p.m.; Saturday and Sunday at 3 and 7:30 p.m. Through June 5. (860) 586-1136; www.outfilmct.org. $9, $7 for students and 60+. VINTAGE BASEBALL GAME Hartford Baseball Grounds, Colt Meadows, Hendricxsen Avenue and Masseek Street, Hartford. Saturday and Sunday, 11 a.m. to 4 p.m., games played by rules of the 1860s and 1880s. Presented by Friends of Vintage Baseball. (860) 956-9465; friendsofvintagebaseball.org; Free, but spectators should provide their own seating. Information on events to be considered for inclusion in Spare Times can be sent to weekend@nytimes.com. A Spare Times entry on Friday about a Memorial Day observance in Manhattan at 10 a.m. on Monday misidentified at one point the area of the borough where it will be held. As the entry noted, it starts at the Soldiers’ and Sailors’ Monument at Riverside Drive and 89th Street, with a procession to Grant’s Tomb. It is not in Inwood, which is at the northern end of Manhattan. Summer On the Hudson (SOH), one of New York City's largest free summer festivals, now in its Tenth Anniversary Season, goes into high gear in July at Riverside Park South with Movies Under the Stars, the Children's Performance Series, the pop-music Acoustic Sundays, and sports and recreation for the whole family. The six-month series, running through October 10, is an annual summer arts and cultural festival in Riverside Park South, West 59th Street to West 72nd Street at the Hudson River, presented by The New York City Department of Parks & Recreation. The 2010 Festival once again features a wealth of free events for the entire family. This year's Movies Under the Stars (July 7-August 11) are themed Tall Tales, and include the larger-than-life Pan's Labyrinth, Stranger Than Fiction and Neverending Story; the Sunday evening Acoustic Sundays (July 11-August 15,) features the SOH debuts of Grammy-nominated Michael Powers Frequency and Meta and the Cornerstones' African pop and reggae; the Children's Performance Series, Thursday mornings July 8 to August 12, entertains with Improv4Kids, Robbi K, Bindlestiff's Swashbuckling Cirkus and much more. The ever-popular kayaking, every Saturday and Sunday through October 10, includes free instruction; there is health and fitness with yoga, pilates and soccer and wee basketball for tots. Food and drink is for sale at the park's on-site Pier I Café, where patrons can sit and watch the action. Upcoming in September is the Sunday September 12 park-wide West Side County Fair, bringing a bit of green and country to the Upper West Side - including livestock! (kayaking and yoga will still be running, as well). All events are FREE to the public and are programmed by Zhen Heinemann, Riverside Park Director of Programming. For more information on all events, please call 311 or (212) 408-0219, or visit www.nyc.gov/parks /soh, or www.riversideparkfund.org.